What is the Amazon Fire TV Stick? The Amazon Fire TV Stick is a new device joining the ranks of home entertainment streaming technologies. The Fire Stick plugs into your TV’s HDMI port giving you access to your favorite TV shows, movies, subscription services, music, photos, and games. The Fire TV Stick houses all of your favorite content and is easily transportable, so you can take your media anywhere! The Fire Stick makes it easy to watch your favorites on the go. Imagine being able to take your TV with you when you go on vacation. That’s the functionality you get with the Fire TV Stick. The Fire TV Stick houses all of your content and is completely portable. Simply remove your device and take it with you when you travel. Plug it into any compatible TV to gain instant access to all of your favorite videos. If you are an Amazon Prime member, your Fire TV Stick comes pre-registered to your account. You have immediate access to all of your Amazon Prime content as soon as you plug your Fire TV Stick into your HDMI port. Being a Prime member also lets you choose from a cache of Amazon Originals that cannot be accessed by the average user. When you receive your box from Amazon, you will have everything you need to make the Fire TV Stick work. In the box you will find your new Fire TV Stick, the remote, a USB cable and power adapter, HDMI extender, 2 AAA batteries, and a guide to get you started. 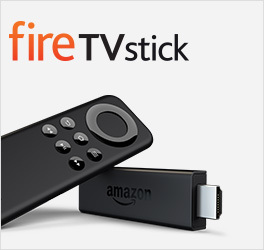 The Amazon Fire TV Stick rivals other popular streaming devices like the Roku and Chromecast. How does the Amazon Fire TV Stick work? Your Fire Stick plugs into your HDMI TV via USB port, connects via Wi-Fi, and comes equipped with a Bluetooth remote. Simply plug your Fire Stick in and you will be directed through the setup process and prompted to sign into your Amazon account. The Fire Stick is a central repository for all your content. Once logged on, you will have access to any music and videos purchased through your Amazon account. In addition, you can view any pictures uploaded to your Amazon Cloud service. Using your device, you also have access to thousands of apps and games. For instance, you can use your Fire TV Stick to open the Netflix app and watch trending Netflix videos. Or, open YouTube and browse the latest uploads from your favorite vlogger. Other services like HBO Now, ESPN, and Hulu can also be accessed with your Fire TV Stick at a cost. However, even with the fee, you get the advantage of being able to choose your preferred services instead of being tied into a cable package. Games are also available. But, you will need a controller which is only available for purchase through Amazon. Amazon offers a Fire Stick and Fire TV. These products offer the same services and both come equipped with a Bluetooth remote. So, what’s the difference? Size: The Fire TV Stick is far smaller than the Fire TV. The Fire Stick is about three inches long and plugs into your TV. Fire TV is a square console that, while sleek, is about four and half inches long on each side. If you prefer the minimalist look, the Fire TV Stick is the winner. Cost: You will find that the Fire Stick is the cheaper option. The First Stick costs $39.99 while the Fire TV will set you back $99. Speed: The Fire Stick will give you 1 GB of RAM, while the Fire TV offers 2 GB of RAM, making the Fire TV more responsive. If you’re a serious gamer, you might want to go for the Fire TV to avoid lags and frustration in loading speeds. Additional ports and storage: With the Fire TV Stick, you won’t have options for expansion. The Fire TV console has a USB port, Ethernet port, and microSD slot, amking it easier to store and access content. Evaluate your needs and budget before determining which Fire TV option is right for you. When people hear the phrase “streaming technology,” most groan and think about how they just want watching TV to be easy. Well, the Fire TV Stick makes it simple. Only now, instead of searching through those horizontal bars of endless TV shows, you can access what you want to see, when you want to see it. For easier searching, the Fire TV Stick offers voice control using Amazon’s Alexa. You can get this capability two ways. Simply press the black button and speak your choice. If that extra cost doesn’t appeal to you, you can download the free Fire TV Remote app on your phone. Using your phone’s native voice prompts, you can speak your choice and your phone will relay your choice to the Fire Stick. Why else would you want the Fire TV Stick? Well, it learns. Or rather, it uses your preferences to make predictions about what you might like. Using ASAP (Advanced Streaming and Prediction), the Fire TV Stick offers you choices of related programming based on your previous watches. If you love Amazon Fire TV, you also have a phone option. Check out more about Amazon’s Fire Phone.